Copthorne Hotel Dubai - Dubai Hotel Located in Dubai City Centre, Dubai Shopping Area and Dubai Business District! Located next door to the Deira City Centre Shopping Mall and within easy reach of the Dubai’s commercial district, the Copthorne Hotel is a well-positioned, Spacious 4-star hotel. Contemporary in style, the hotel has 188 spacious and comfortable guest rooms and suites. Rooms are elegantly designed and offer lovely views over Dubai Creek and the city from their private balconies. The Copthorne offers the guest a choice of 4 food and beverage outlets, serving a wide range of international food. The Gazebo Terrace, which serves traditional Arabian specialties, is popular for its fantastic food and al fresco dining. Guests to the hotel should be advised that alcohol is not served at this property. Leisure facilities at the hotel include an outdoor swimming pool and sun terrace, a well-equipped fitness centre plus sauna and steam bath. The health club has separate opening hours for ladies and gentlemen - ladies from 07.00-13.30 hours and gentlemen from 14.00-19.00 hours. 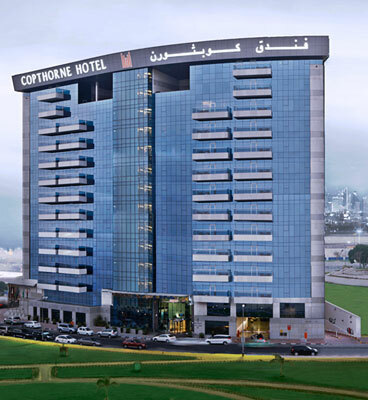 The Copthorne Hotel is conveniently located a 5-minute drive from Dubai International Airport.